LAS VEGAS – Employee wellness is not a new idea, but new ideas from digital health companies like Castlight Health and Fitbit, as well as incumbents like UnitedHealthcare, are reimagining and reinvigorating the space. 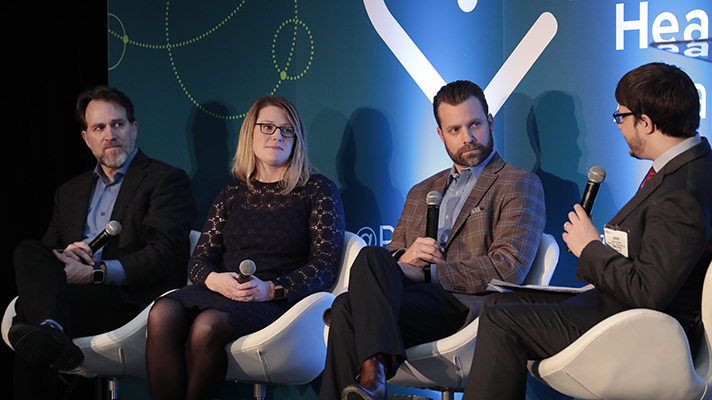 At a panel at the Personal Connected Health Alliance’s Innovation Leaders Summit at HIMSS18 (moderated by yours truly), Castlight Health President Derek Newell, Fitbit Health Solutions Chief Operating Officer Amy McDonough, and UnitedHealthcare Vice President of Emerging Products Paul Sterling discussed the evolving space and how wearable technology is leading to record engagement and motivation for employee populations. UnitedHealthcare’s Motion program, a collaboration with Qualcomm, pays users $4 a day to meet health and wellness goals, as measured by trackers like Fitbits, Samsung devices, and, soon, as he announced at the show, Apple Watches. They can put that money toward other healthcare expenses. While the question is often phrased as which is better, intrinsic or extrinsic motivation, panelists all agreed that well-designed programs should include both. They should also give rewards quickly, rather than making the individual wait a year. And rewards should be as personalized as possible. Finally, McDonough added, any wellness program that succeeds needs to have a culture fit with the organization employing it.